The Charlotte Bobcats announced today that the team will utilize purple and teal as its primary colors when it changes its name to the Charlotte Hornets prior to the 2014-15 NBA season. 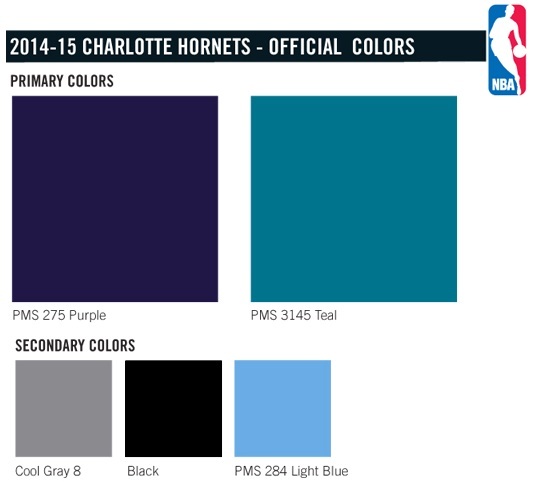 The colors, which were used by the original Charlotte Hornets during their tenure in the city from 1988-2002, will be accented by secondary colors black, cool gray and light blue. As part of the survey process prior to the decision to change the name, Harris Interactive surveyed the Charlotte community, as well as current season ticket holders and team sponsors. In each of the three groups, an overwhelming majority of those surveyed were in favor of using the purple and teal of the original Hornets as the colors of the rebranded team. Starting tomorrow, the organization will introduce a new phase of its Buzz City campaign, centered on “Painting the City” with the return of the purple and teal colors to Charlotte. The three-week campaign will include digital, print and billboard advertising. The revealing of the colors is the first step in the process of transforming the Bobcats into their new identity as the Hornets. Additional phases include the unveiling of the logo, uniforms, court, mascot and dance team. Throughout the current season, the team will host Buzz City Nights, which will include exclusive Buzz City fan giveaways and in-arena activations that celebrate the history of Hornets basketball in the Carolinas. The initial Buzz City Night will be Saturday, Dec. 21, when the first 10,000 fans will receive a long-sleeve Buzz City T-shirt courtesy of Mercedes-Benz.